New Delhi: Air India Ltd won back more of its domestic passenger market share in August, posting a second straight month of increase since its share started sliding at the start of the year, falling to a low of 13.2% in May. The flag carrier ended August with a 17.4% passenger share, up from 16.5% in July, partly as it priced tickets cheaper than those of low-fare carriers. To be sure, Air India is still to match up to its market share of 18.3% last August and stands fifth behind Jet Airways (India) Ltd, Kingfisher Airlines Ltd, IndiGo and SpiceJet Ltd.
Air India’s flight occupancy, however, increased to 72.8% in August from 65.5% earlier. “Their market share has increased because they drastically reduced their fares in June-August period," said Rashesh Shah, an analyst at brokerage ICICI Securities Ltd. “That generally is a short-term strategy. You can’t do a business on a loss basis. Gradually, they will have to increase the airfares." 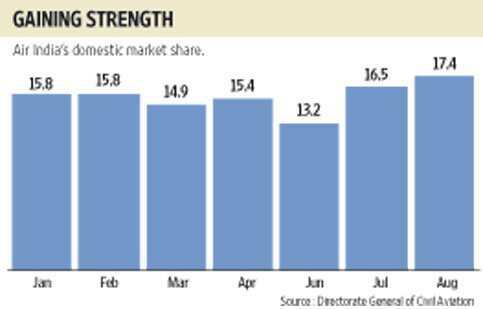 Market share for Jet Airways together with its low-fare subsidiary slid to 26.3% in August from 27% a year earlier. Kingfisher’s share slipped to 18.8% from 20% and GoAir’s to 5.3% from 5.7%. IndiGo grew its market share to 18.7% from 16.4% and SpiceJet to 13.4% from 12.6%. It is not clear if Air India’s pricing strategy is allowing it to gain revenue and reduce daily losses. The airline said in a statement last week that its total passenger revenue, including international operations, increased 12.3% to ₹ 998 crore in August, but did not disclose if was made a loss or profit. “Air India is regaining market share and giving low-cost airlines and full-service airlines a run for their money," said an official with a private airline, on condition that neither he nor his firm be identified. “This is not fair play. Because you are government, you can do anything?" All the three publicly listed airlines—Jet, Kingfisher and SpiceJet—made a loss in the first quarter of fiscal 2012. Jet and SpiceJet had recorded profits in the same year-ago quarter. Shah said all airlines are worried about Air India’s pricing power and will need to shift focus if there is no change. “They (other airlines) will generally need to shift business from domestic to international. They will have to change the mix of operations to avoid getting impacted by this pricing," he said, adding that he expects airfares to rise from October as the peak festival season begins. Bookings are looking strong in the months ahead, the private airline official said, but added, “The larger question remains, when do you make money?"